In tone with the growing interest in the newest exclusive introductions on the high technologies scene – we have crafted for you an advanced Joomla template named Rise of Technology. Our new release is designed to help all of you whose are attracted by the power of new inventions, no matter whether they are related to IT or to any other high technologies, to build relevant websites in a few quick and easy steps. Download Rise of Technology now from the Themza website, add it to your Joomla 1.5.x installation, tailor its layout to your specific requirements straight from the Joomla Admin Panel and enjoy your new attractive hi-tech online presence. 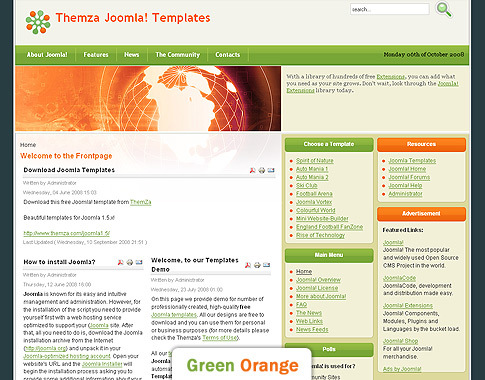 • Various color schemes – blue/orange, green/orange, etc. • Two pre-defined sections (USER 1 and USER 2) for posting Latest News, Archive, Polls, etc. This entry was posted on Monday, October 6th, 2008 at 5:20 pm	and is filed under General updates. You can follow any responses to this entry through the RSS 2.0 feed. You can leave a response, or trackback from your own site.